1- Fleurs du ciel: Light gown dress of flowered guipure, with keels and majestic sleeves of jacquard lamé broché blue and silver. 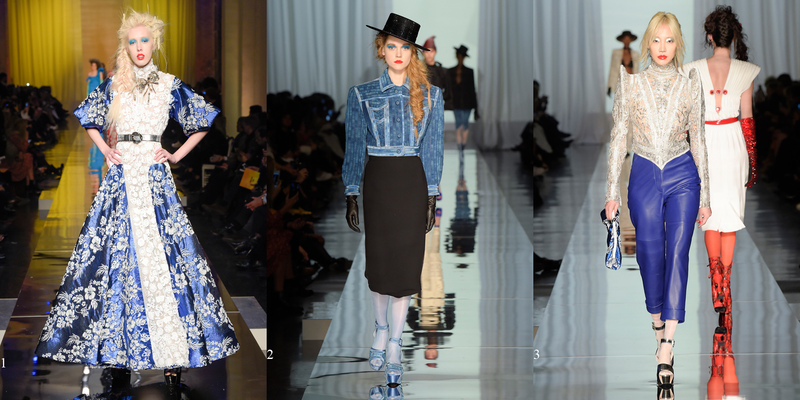 2-Bye bye blues: Mirage of jeans jacket in real designs of faded ribbons, on a black crepe skirt. 3- Le chevalier d’ Eole: Sculpture of Irish guipure scattered with real silver leaves, anamorphic shoulders of accordion ribbon. Blue summer leather trousers. 1- L’éclipse: Dark black muslin, sun carved with embroidered sequins and ribbons. 2-Elle a du blé: Bouquet of golden ears embroidered, wrapped in a corset of sunny leather. 3-Dure à cuire: Black leather Evening dress with chiseled tattoos.